International supporters are also welcome to post a comment! 1. Include your name, state, email, and phone number (if desired). 2. Select “Individual Consumer” as the Category, unless you are submitting your comment as a more suitable selection. This is a required field. 3. State your support for the petition put forth by Americans for Homeopathy Choice. -Try to keep this to experiences away from highly controversial subjects (i.e. cancer is the main one). If you do share how homeopathy helped you in a more serious condition, perhaps mention that you worked with an appropriately qualified homeopath. If you also worked in adjunct with your medical doctor, mention that as well. -Further reasons that you love homeopathy. -How you use homeopathy as a primary medicine in your home with children, elderly family members, pets/furry family, etc. -Create an advisory committee on homeopathy to protect homeopathy as a safe and effective system under FDA oversight. -Withdraw the Draft Guidance for Drug Products Labeled as Homeopathic dated December 2017. 2. Thank FDA for consideration of this matter. 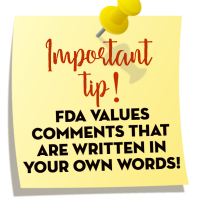 If you are unable to compose your own comment, you may view a sample comment by -Click here.